Director Michael Bay’s (The Island) third foray into the alien robots franchise, Transformers: Dark of the Moon, grossed a tidy $319 million at the box office despite pretty dismal reviews from critics. Shia LaBeouf (Wall Street: Money Never Sleeps) reprises his role as Sam Witwicky, whose first-movie status of geek who can’t get the girl transformed to superstud who can’t get a job. As Sam stumbles through his job search, with his Winnebago-driving parents (Kevin Dunn of Unstoppable and Julie White of The Nanny Diaries) and stunning girlfriend (model Rosie Huntington-Whiteley in her first movie role) giving him encouragement, the robots Optimus Prime (Peter Cullen, TV’s Transformers), Bumblebee and others end up in an even bigger battle for the universe with one of their own long-lost Transformers, Sentinel Prime (Leonard Nimoy, Star Trek). Josh Duhamel (When in Rome), John Turturro (The Big Lebowski) and Tyrese Gibson (Fast Five) are back in their characters from the earlier movies, and added to the cast this time are Patrick Dempsey (TV’s Grey’s Anatomy), Frances McDormand (Almost Famous) and John Malkovich (Secretariat). This means that that are no extras on these versions. Nope. Nothing. Nada. Zip. 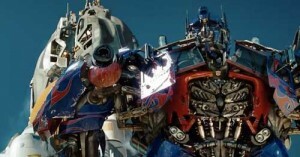 The DVD and Blu-ray release is being promoted with a “Roll Out In PRIME Style” sweepstakes hosted by Hasbro. Entrants have the chance to win a ride to school with Bumblebee, where Optimus Prime will be waiting with Transformers toys. Hostess also is hosting a “Transform Your Treat” sweepstakes, as well as offering a $4 rebate off the purchase of the Dark of the Moon Blu-ray or DVD with the purchase of two Hostess products. Energizer packages have an offer for $5 off, so pick your product for a discount.